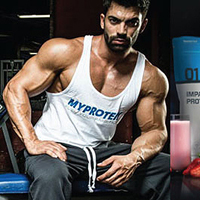 As Chinese consumers pursue a higher quality of life, their diet and tastes are becoming more and more westernised. They have developed the habit of drinking wine at home and at gatherings with friends and relatives. As a result, the mainland wine market is growing rapidly. According to a consumer survey on the mainland wine market  conducted by HKTDC Research, the older the respondents, the higher their tendency to buy wine at bricks-and-mortar stores. While the majority of respondents learn about wine from friends / salespeople, younger consumers and those who have a higher monthly household income tend to acquire such knowledge by trying wine by the glass at specialist wine outlets / bars, visiting wine fairs and attending wine tasting events. 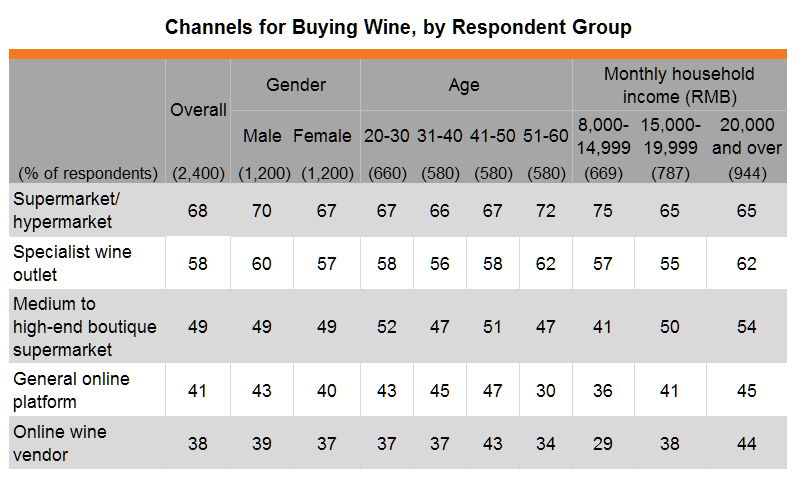 Survey respondents’ prime consideration factor in purchasing wine is “taste”, followed by “brand” and “grape varieties”. As regards place of production, 75% of the respondents said they prefer wine produced in France, followed by China (46%) and Italy (30%). Hong Kong companies wishing to tap the mainland wine market should try to understand the buying behaviour and consumer preferences of their target customers in order to formulate the right marketing strategy. The survey found that the majority of the respondents (68%) buy wine at supermarkets / hypermarkets, with the exception of those in Guangzhou and Harbin who mostly make purchases at specialist wine outlets. Where online shopping is concerned, the proportion of respondents in Beijing (48%), Shanghai (47%) and Suzhou (47%) who buy wine on general online platforms (e.g. JD.com, Tmall.com) is markedly higher that the overall average of 41%. Moreover, 38% of the respondents said that they would purchase wine via online wine vendors (e.g. 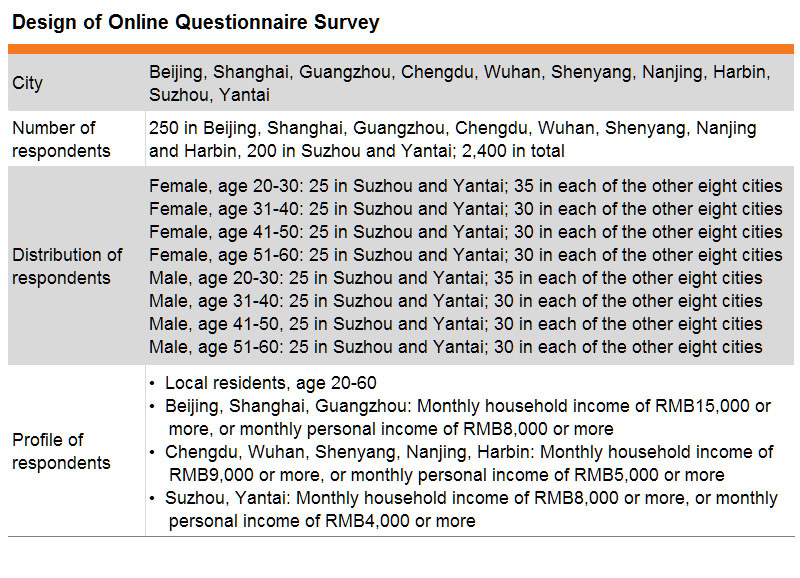 vinehoo.com, majorcellar.com), with the proportion of respondents in Suzhou (45%) and Guangzhou (44%) considerably higher than the overall average. Some focus group discussion participants pointed out that the advantage of buying wine online is they can make purchase decisions after reading the comments on the wine made by the online shop as well as by other consumers. The older the respondents, the higher is their tendency to buy wine at supermarkets / hypermarkets and specialist wine outlets. 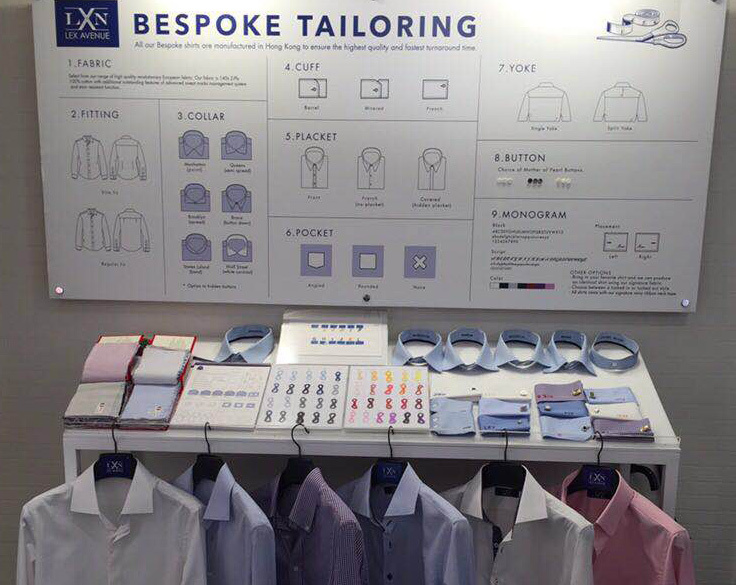 The advantage of making purchases at bricks-and-mortar stores is that salespeople can recommend the right product to customers according to their needs, occasion for consumption and acceptable price points. 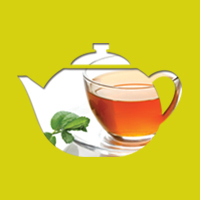 They can also provide customers with information on the special taste and brand history of different products. The percentage of respondents aged 41-50 buying wine via general online platforms (47%) and online wine vendors (43%) is higher than that of other age groups. The market positioning and price of wines sold at different channels also vary. 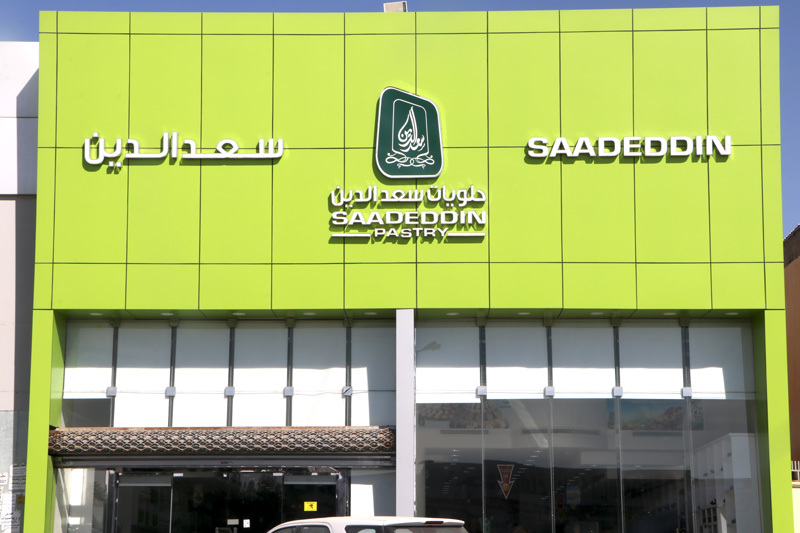 Generally speaking, wines offered at supermarkets / hypermarkets mainly target the mass market, while products sold at wine merchants are higher in grade and price. 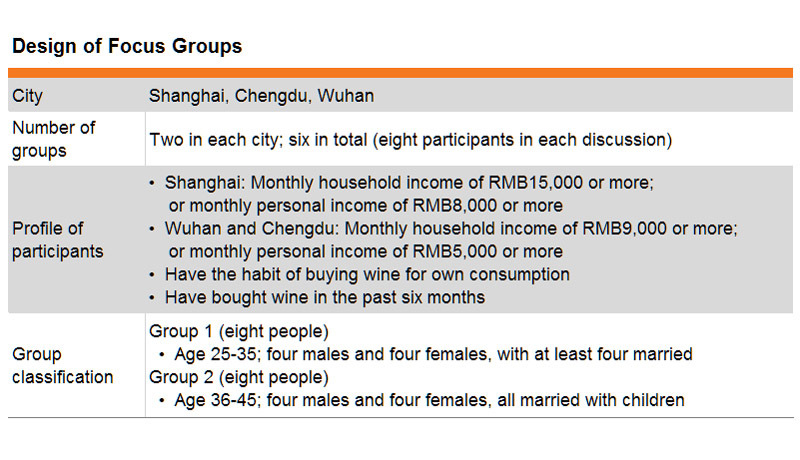 Respondents with a monthly household income of RMB8,000-14,999 tend to buy wine at supermarkets / hypermarkets more often, whereas those with a monthly household income of over RMB20,000 purchase at wine shops more than those in lower income brackets. Survey findings also show that the higher the monthly household income, the higher is the proportion of respondents buying wine via online platforms. 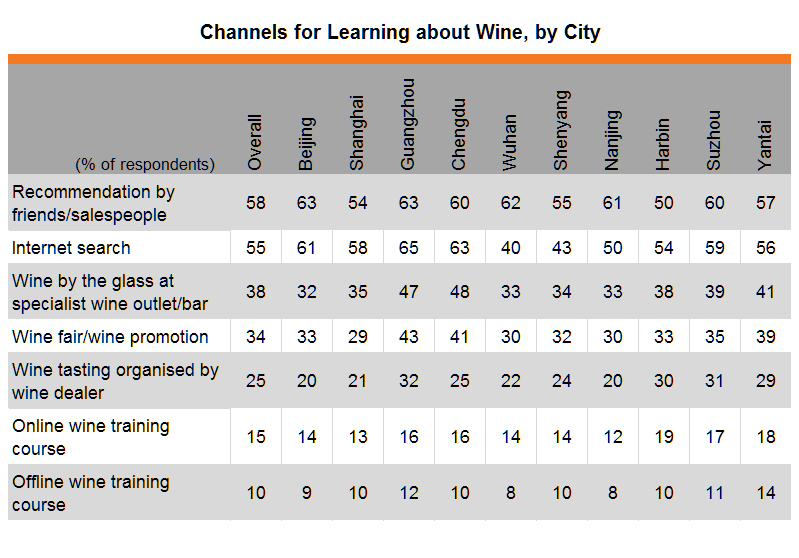 Mainland consumers mostly learn about wine from friends, salespeople and websites, with relatively few of them taking dedicated training courses. 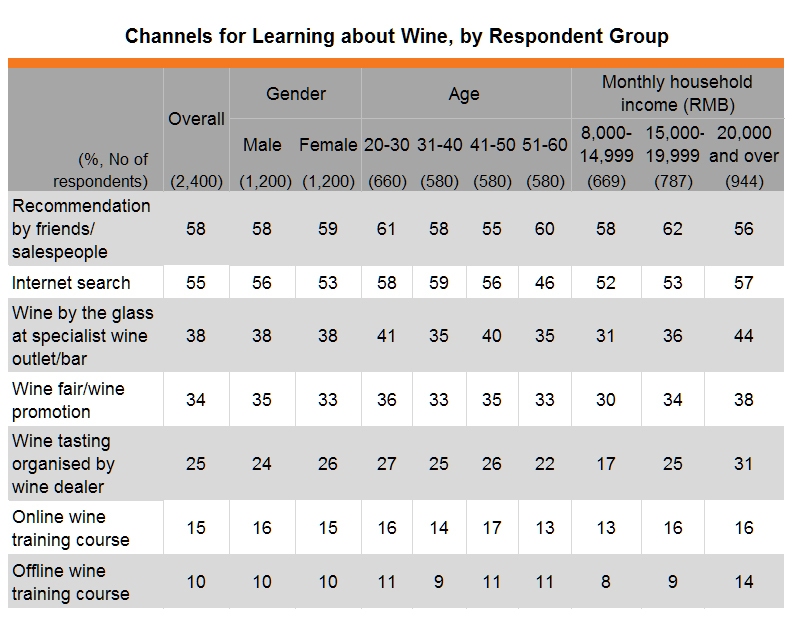 According to the survey, most of the respondents (58%) obtain wine knowledge from friends / salespeople. 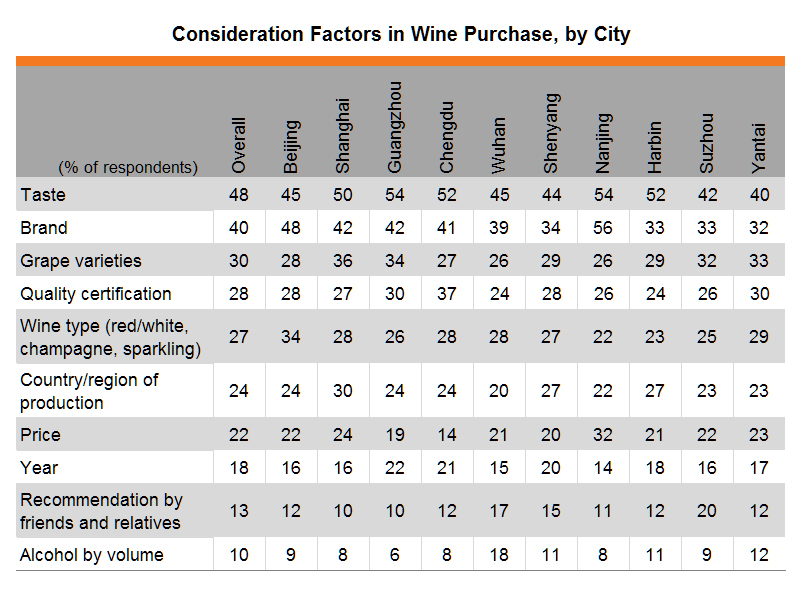 However, respondents in Shanghai, Guangzhou and Chengdu tend to acquire such information by searching on the internet, while those in Guangzhou prefer to obtain wine information by visiting wine fairs and attending wine tasting events. As pointed out by one vineyard director, wine dinners are becoming popular in major mainland cities. Wine dinners are typically organised by wine dealers at upmarket restaurants on a regular basis by selling tickets to selected customers. Each course of the meal is specially designed to pair with different wines, allowing the diners to eat gourmet food, taste good wine and discuss the characteristics of each wine. 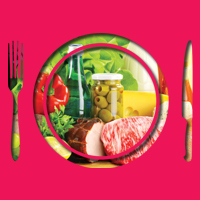 These wine dinners are particularly effective in promoting wines newly launched onto the market. 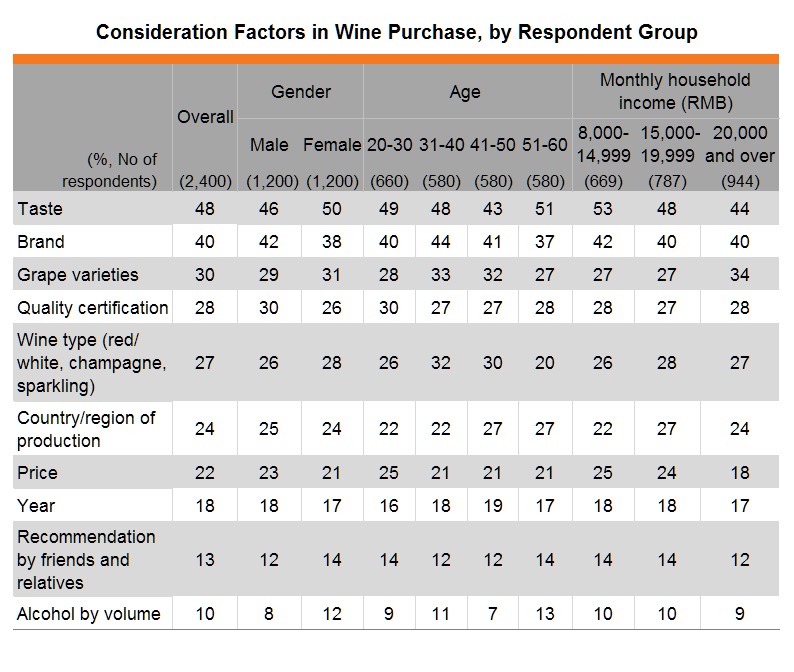 The survey shows that the proportion of respondents with a higher monthly household income (over RMB20,000) and those at a younger age (aged 20-30) are more likely than other groups to learn about wine through trying it by the glass at specialist wine outlets / bars, visiting wine fairs, and attending wine tastings held by wine dealers. In light of this, Hong Kong companies planning to host such wine promotional events should target these two consumer groups. Mainlanders are becoming more rational in wine consumption. Today, when buying wine they tend to choose the product that suits their taste rather than go after brand and price. In the past, wine was mostly consumed at business events, where expensive products meant face. But today, wine is mostly consumed on private occasions and people often like to have a sip of wine at home and at gatherings with friends and relatives. On these occasions, the choice of a good product at a good price can show that one is discerning and knows how to choose the best wine. The survey finds that nearly half of the respondents reckon that “taste” is the most important consideration factor in purchasing wine. 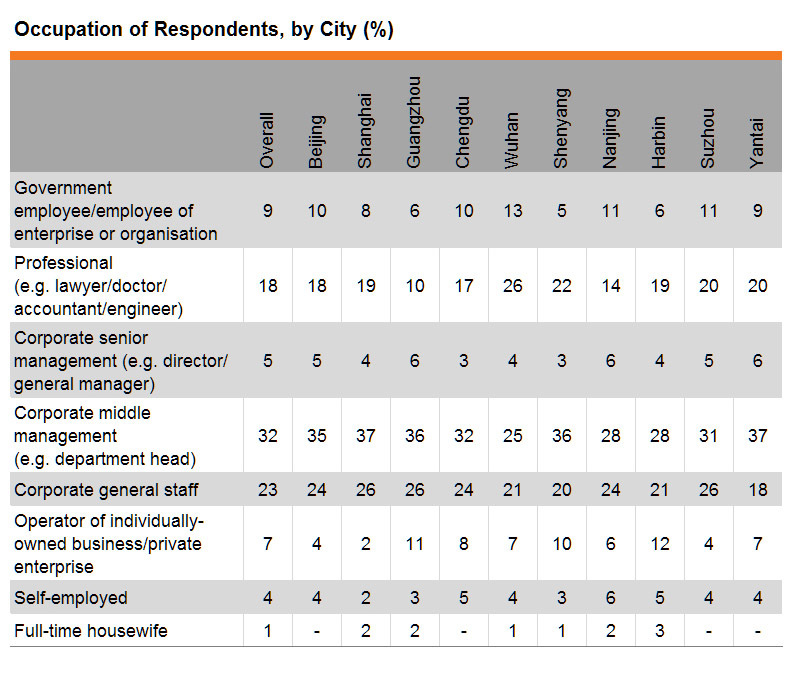 However, 48% of the respondents in Beijing and 56% in Nanjing attach more importance to “brand” than to “taste”. 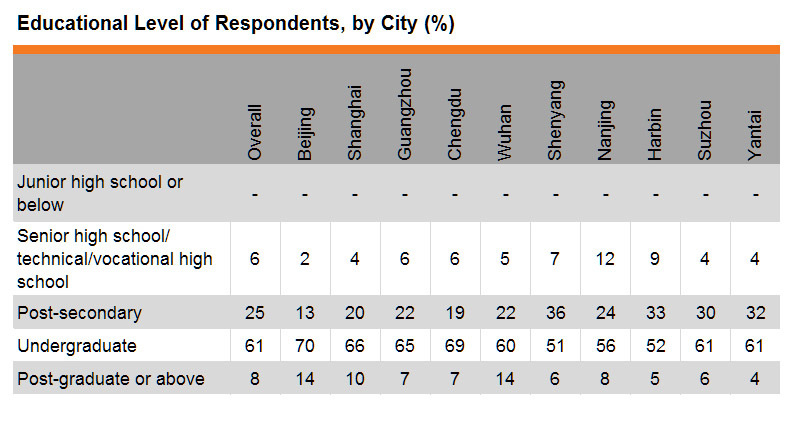 The percentage of respondents in Nanjing (32%) considering price as the prime factor is higher than the overall average (22%). Overall, different respondent groups’ consideration factors in buying wine do not differ greatly. “Taste” is the most important criterion, followed by brand and grape varieties. France is the most prestigious wine producer in the world, with Bordeaux and Burgundy being the best-known production regions. The majority of respondents (75%) indicate that they prefer French wine, with the proportion of those in Shanghai being the highest (84%). Second to France is China, with 46% of the respondents saying that they prefer wine produced in the mainland. Famous wine producing regions in China include Yantai and Qingdao in Shandong province, Shacheng in Hebei province, and Lantian in Shaanxi province. 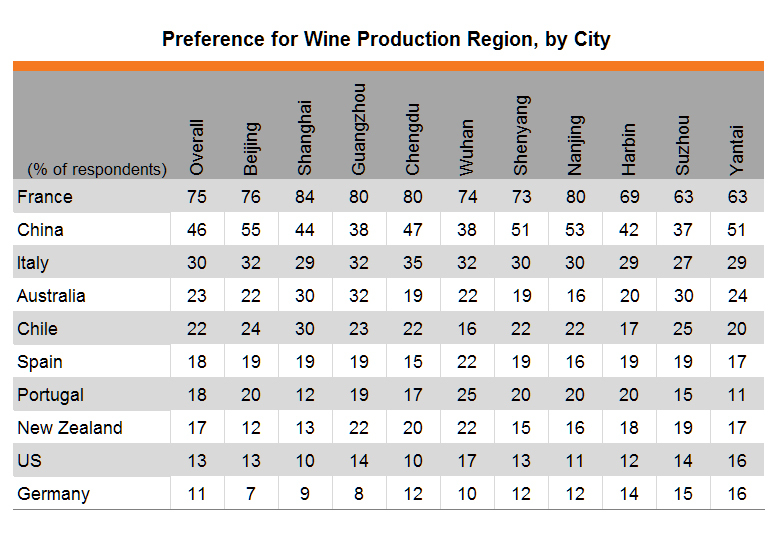 Wines produced locally in China are popular with mainland consumers, especially respondents in Beijing (55%) and Nanjing (53%). Some of the focus group participants pointed out that they are happy to try wines from different regions as they are still in the process of learning how to choose wine suiting their own taste. 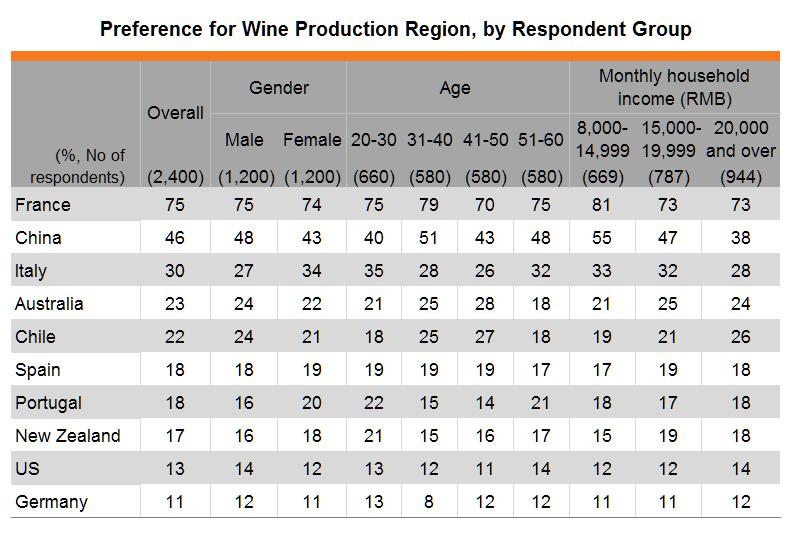 Different respondent groups do not differ greatly in their preference for wine production regions, with the overall top three being France, China and Italy. In recent years, mainlanders have become more rational where wine consumption is concerned. They tend to choose wine that suits their own taste rather than opt for expensive brands. They have a strong interest in trying different wines from all over the world in order to identify high price-performance ratio products. 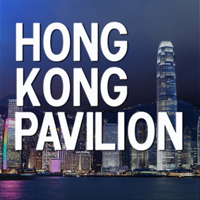 Hence, Hong Kong companies can bring in medium to high-end wines from different production regions and sell mass-market products at supermarkets / hypermarkets, while offering exclusive and niche products at specialist wine outlets and boutique supermarkets. To reach out to young consumers and high-income earners, Hong Kong companies can consider targeted marketing by participating in wine fairs, organising wine tasting events or hosting wine dinners. Mainland consumers like to buy wine via general online platforms and online wine merchants. They also learn about wine by reading user comments and product information available on these platforms. Hong Kong companies tapping the mainland wine market should not overlook the importance of online platforms in both sales and promotion. Today, the bottle size of most of the wines offered on the market is 750 ml. The survey finds that 73% of the respondents prefer smaller bottle size (such as 375 ml), in particular female respondents (80%). To address this market need and stand out from the crowd, Hong Kong companies can consider supplying wine with a smaller bottle size.